When Shar-Pei Puppies Grow Up, Are They Still Wrinkled? Your adorable bundle of love will keep some wrinkles for life. Chinese Shar-Pei were popularized as "wrinkle dogs," and these rumpled little darlings live up to this description as puppies. But will your corrugated pumpkin stay wrinkly past puberty? The answer is yes, but the number and placement of wrinkles may vary, depending on your pup's coat texture. Baby Shar-Pei look like an adorable pile of wrinkles. As they grow up, they "grow into" their loose skins, and the wrinkles may disappear from their legs, flanks, and bellies. The breed standard says that adult Shar-Pei have skin folds on the head, neck and withers (the back between the shoulder blades). Most adult Shar-Pei keep their heavily wrinkled faces, and only Shar-Pei with forehead and side face wrinkles and sunken eyes (from a deeply wrinkled brow) are considered show- and breeding-quality. Whether your pup keeps a heavily wrinkled neck and back depends on the coat type. 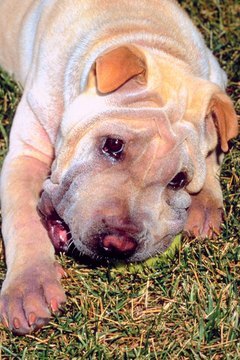 Your baby Shar-Pei will not develop her adult head shape and wrinkle pattern until at least 1 year of age. Horses, Brushes and Bears, Oh My! Shar-Pei come in three coat varieties: horse, brush and bear. The horse coat is the least wrinkled in adulthood. These dogs may keep only the wrinkles on their faces. The coat is very stiff, bristly and short, and the skin is not as pliable as it is in the other coat varieties. Brush coats are the longest coat variety accepted as show- and breeding-quality. The fur on a brush coat Shar-Pei may be as long as 1 inch, and it is much softer than a Shar-Pei horse coat. Brush coats keep more of their wrinkles, and adults may still have wrinkles on their chests and front legs. Bear coats are not considered show- or breeding-quality, but some obedience and agility contests accept them. These have long, softer hair, more like that of a chow chow. Shar-Pei require no special treatment to keep their wrinkles neat and clean. These delicate-skinned, rough-coated beauties only need baths with doggy shampoo, a brisk towel dry, and brushing with a rubber curry comb. Horse coats usually shed their entire coats once a year, and may need weekly baths and daily brushing during shedding time. Brush and bear coats may shed consistently throughout the year. A bath when your pal is dirty, and weekly brushing, are usually sufficient to keep these coats in shape. Bear coats may require a grooming rake. 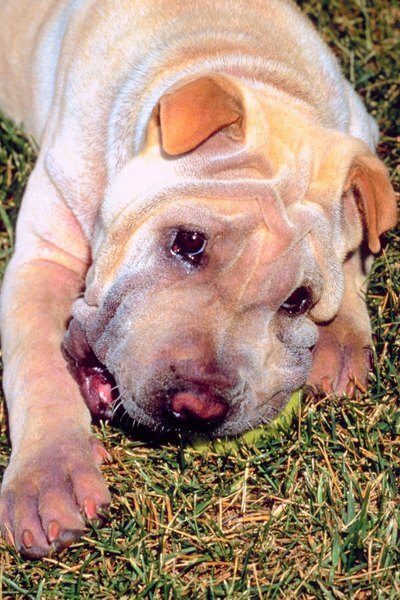 The delicate Shar-Pei skin is susceptible to allergies and a few inherited conditions. Itching from allergies and fleas is especially problematic for these little darlings, because scratching can lead to self-mutilation. The Shar-Pei wrinkles come from a super-abundance of mucin -- a normal skin protein. Sometimes these dogs can suffer from a condition called mucinosis, where mucin forms painless blisters under the skin. If these burst, you will need to keep the area clean to prevent infection. In most affected dogs, the condition comes and goes without creating problems.